Have you found an online vendor selling Sammys Beach Bar Light? I first researched this rum with caution before buying it. As a musician, I only liked Sammy Hagar's brief stint as lead singer of Chickenfoot. His Cabo Wabo tequilas are highly over rated and I had serious doubts about his rum. My original research showed that this rum was made from sugar cane juice pressed from cane grown on Maui. Hmmm!!! An agricole rum from Maui could be quite interesting, so I bought it without reading the new label that says Puerto Rican rum. Graded against all of other white rums, it ranks as a high level 6, but it is not quite an agricole any more. It is too smooth to have come from the Bacardi factory, so this alleviated my fears when opening up the bottle. My guess is that it comes from the folks at Don Q. It is a very good mixer white rum, but at $22 per bottle, there are several others that offer better taste and value. However, for tropical fruit based drinks, Sammy's is a better mixer than my old reliable Cruzan Gold. Sammy's also makes great original daiquiris, but downright terrible Cuba Libres. I later looked up his website to read more about this rum. The sugar cane comes from somewhere in the Caribbean and is distilled at Distileria Seralles near Ponce, Puerto Rico, which is where Don Q rum comes from. My guess was right. It is then bottled in California. This is indeed a very different white rum that really cannot be compared to other white rums or pure agricoles. This one is like a subdued agricole that won't offend anyone. Some may like it very much and some like me don't particularly care for it. It is worth giving it a try for the unique twist that it adds to tropical drinks. Enjoyed a bottle of Sammy's Beach Bar Rum Light with my friend while road tripping through 18 states and 5,000 miles. Silly and super cheap looking bottle and label design. Pure alcohol to the nose and palate. Very strong burn at the end. Nasty even when mixed. From Montrose to Sammy Hagar's solo days to Van Halen to Chickenfoot and being Guy Fieri's best man, he now has Cabo Wabo Tequilla and a rum portfolio to add to his repertoire. A decent mixing rum with a strong taste of cane juice and some heat. Floral notes with a Martinique Agricole style of rum. Not bad for the $24 I paid for it. Pretty straightforward clear run made from sugar cane. Balanced. Superior mojitos will be in your future with a bottle of this stuff. I love the sugar cane flavors. Delicious! Though a tad overpriced (docking it one point), this rum's really not bad. Not a big fan of Mr. Hagar or his brand, but he sources his sugar cane from Maui, which is very cool. If you're going for a beach bar drink, you could do much worse than to use this stuff! Fantastic for lighter tiki cocktails, or even a dryer concoction. This stuff is a nightmare to pick up in the UK but having knocked up a few daiquiris with it I'm loathed to use anything else (Cruzan was my previous go to but its a very different flavour profile and frankly appears pretty chemical by comparison). Beautiful vegetal aroma and smooth finish without being at all polite. A great tasting white rum from Sammy Hagar, the maker of Cabo Wabo tequila. Beach Bay rum is great on its own or mixed with citrus and lime. This rum has a nice florally nose that you can really pick up the sweet sugar cane smell. The taste is fresh and clean with a flowery taste and mild heat. This is good for daiquiris but for the money I would recommend Shellback. Suprisingly harsh. Not great. Does have a flowery finish. Not my favorite. CHICKENFOOT (Google it, folks then buy the CDs...great music). When I heard he started up a Hawaiian based rum company I wanted to try it. Problem was...I couldn't find any locally. 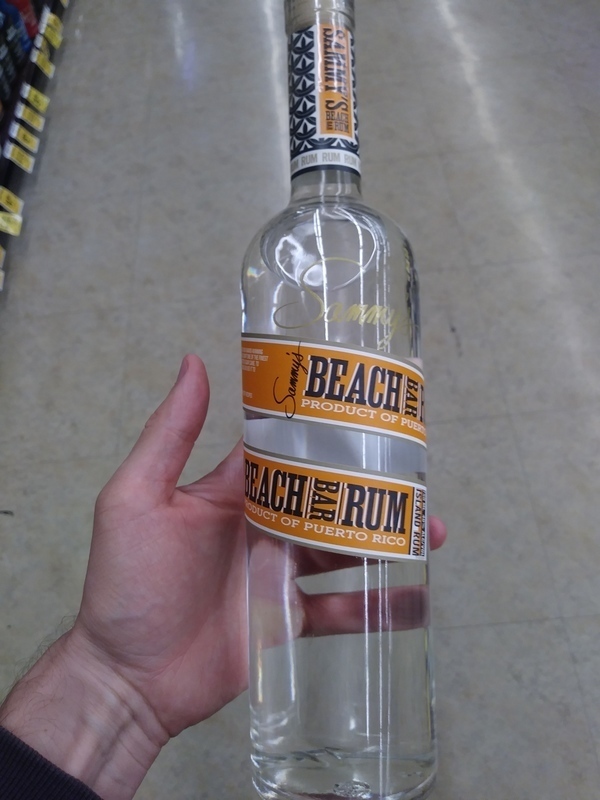 Until I was on a weekend getaway with my wife on St. George Island, Florida and I decided to check out the sole liquor store on the island (I have a habit of checking out liquor stores wherever I am at...never know when you'll come across something unique the local stores don't carry) and they had a bottle of Sammy's Beach Bar Rum. It's a clear rum in a 1 litre bottle. Definitely a crisp rum with definite sugar cane flavor. Clearly a mixing rum. Upon doing some research I discovered it is made from first-press Hawaiian sugar cane juice and resembles more of a French "rhum agricole" or cachaca. I'll take their word for it since I don't know diddly about either taste-wise. I just know this is very good rum which works well as a mixer. I use it in Coke Zero. Good stuff! This is an above average light rum. Strong notes of sugarcane; it tastes like a rhum agricole/cachaça. It also has a little pepper, though I'm not sure if I notice the coconut and banana they advertise. It's quite good actually for a light rum. In fact, one of the better light rums I've tried. Definitely worth a try, especially if you like light rums or agricole!